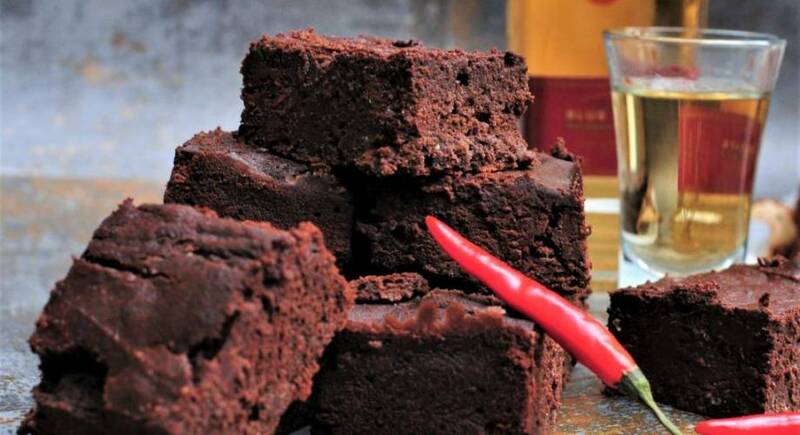 These deliciously decadent and fudgy brownies are both gluten and lactose free, but you wouldn’t know it as they are so tantalisingly moreish. A cheeky splash of tequila adds a grown up edge. Pre heat the oven to 180c/160c fan/gas mark 4. Lightly grease a 20 x 30cm tin and line it with baking paper. Put the drained beans, vanilla, salt, chilli powder, tequila and 2 eggs in a bowl and blitz with a hand blender until the mixture is completely smooth. In a separate bowl place the butter, sugar, cocoa and 4 remaining eggs and beat with an electric whisk until smooth and creamy. Start off slowly then increase the speed. Beat in the baking powder and then whisk in the bean mixture and fold in the chocolate chunks. Using a spatula scrape the mixture into the prepared tin ensuring that it is level. Bake for 25 minutes until firm to the touch. The brownies will keep for a few days in a tin at room temperature or in an airtight box in the fridge for a week.